Example of a completed proposed park site selection map for Los Angeles, California. The new edition of Understanding GIS: An ArcGIS Project Workbook (for ArcGIS 10.1) takes a fresh approach to teaching the essentials of ArcGIS for Desktop. Where the majority of introductory GIS workbooks are organized around the features and functions of the software, Understanding GIS is built around a real-world geographic analysis project. The problem to be solved is the selection of suitable land for a new neighborhood park in Los Angeles, California. 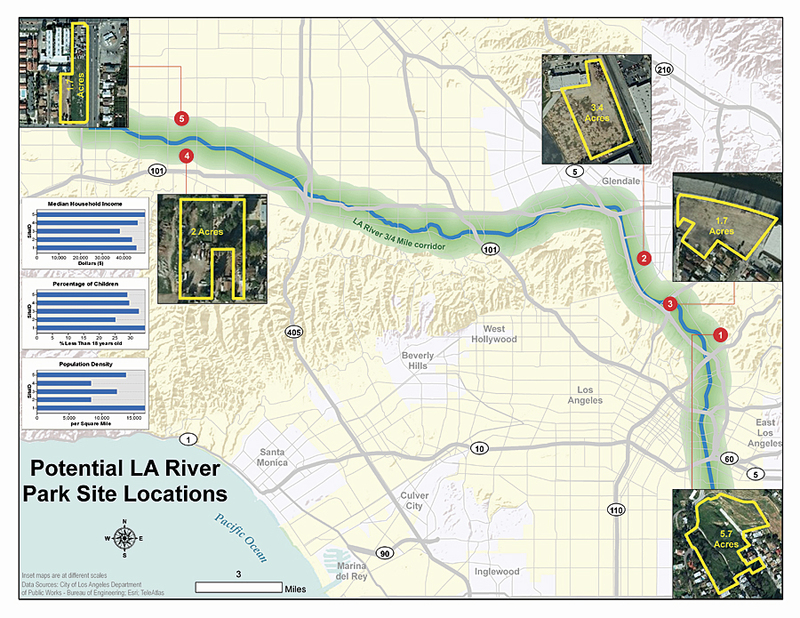 Criteria include proximity to the Los Angeles River, land parcels of a certain size, minimum thresholds for population density and presence of children, as well as median household income levels. Starting data for the project is provided on a companion DVD. The book guides readers through the best practices for conducting an analysis. First they get an overview of the problem and the study area. Next they assess the data requirements and review the geospatial data provided (in various formats) before selecting the most appropriate layers, processing them as needed, and building them into an Esri geodatabase. After some final data editing, a series of analytic steps are carried out to find a handful of candidate sites. These analytic steps are then encapsulated into a model that documents the methodology and makes it easy to repeat or modify the analysis with adjustments to the input parameters. To communicate the analysis results, the student is next guided through the process of designing and producing a rich cartographic product with inset maps, charts, and other annotation. Finally, in the book’s concluding lesson, the results are shared online and made available to the public at large. Understanding GIS provides context and meaning each step of the way so that the student reaching completion of the project knows why each step was carried out the way it was. Hundreds of annotated graphics, illustrations, and photographs enrich the user experience; full-page topic articles and callouts make this a reference book that will prove useful again and again as readers apply the skills learned to their own GIS projects. The book’s companion website includes material for further study, as well as a series of fully narrated demonstration videos that readers can use to follow along as they complete the work themselves. In this new 2013 revision of Understanding GIS, the included trial version of the software has been updated to the 10.1 version of ArcGIS for Desktop and extended to a full 180-day license, making it ideal for semester-length college courses, as well as self-study audiences. Whether you’re new to ArcGIS for Desktop or a working professional looking to deepen your knowledge of geospatial analysis, Understanding GIS: An ArcGIS Project Workbook will fit the bill. The book’s coauthors have decades of combined GIS and analysis experience between them. Christian Harder is the author of several volumes of GIS case studies and was the founding publisher of Esri Press; Tim Ormsby has authored or coauthored numerous GIS workbooks, including the worldwide best seller Getting to Know ArcGIS Desktop; and Thomas Balstrøm is a professor of geography at Aalborg University in Denmark and the coauthor of the Danish-language The Book on GIS Geodata. 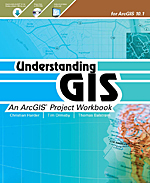 Understanding GIS: An ArcGIS Project Workbook—ISBN 9781589483460, 364 pp., US$79.95.